It absolutely delights me that the MOOC I’ve anticipated all summer uses the W.H. Davies poem “Leisure,” the source of the opening quote, to make several points about mindfulness, the healing power of literature, and our need to clear a mental corner for contemplation. 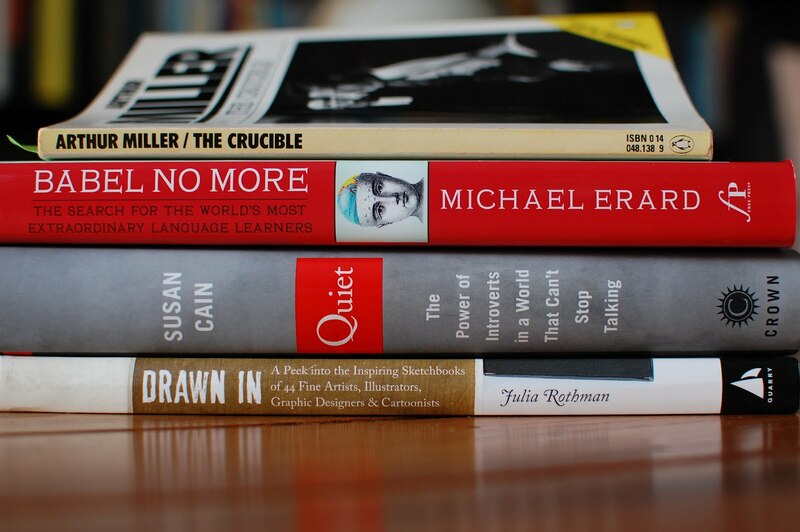 Said MOOC accounts for three of the books on this weekend’s pile: Some of My Best Friends Are Books, How to Read a Poem, and Stressed, Unstressed. Liney’s Into the Fire is the second book in a trilogy, the first of which I read on vacation two years ago. I remember The Detainee as a gripping story that suffered from uneven writing. In the end, though, story won. I have, however, contemplated flinging the follow-up across the room, it’s that badly written. Is it vacation nostalgia that keeps me reading? 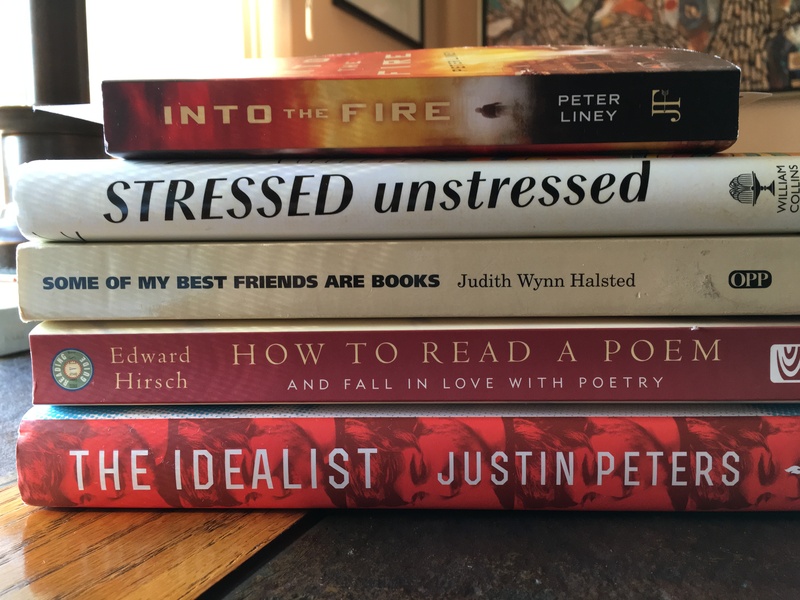 The Idealist ended up in the pile when I heard Rick Kogan’s interview with author Justin Powers two weekends ago. The book began as a long Slate profile of Aaron Swartz. We visited our daughters this holiday weekend, which gave us time to listen to NPR and P.G. Wodehouse’s The Code of the Woosters, every other sentence of which I could press into my commonplace book. We also took two bike rides, the first of which was the most memorable: At the turnaround point, we paused for water, coffee, and some nuts. Swallows swooped and darted overhead. Prairie grasses and flowers bent in the breeze. The trees and underbrush thrummed with the sounds of animals and birds making the most of summer’s end. We had no choice. We simply stopped and stared. Right back at you! Have we really been at this blogging “stuff” for thirteen-plus years? Hello! I just tried to leave a comment and it didn’t go through, so my apologies if they both eventually show up. I’m another reader who hasn’t visited blogs in a long, long time. Recently I dusted off my old blog and clicked some of the “Better Blogs” links, and I was happy to see that you’re still blogging, still writing thought-provoking posts, and still sharing what you’re reading and thinking. I look forward to catching up and reading more! Thank you for “finding” me and for the kind words!